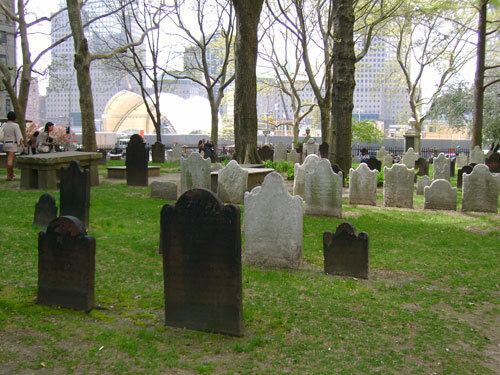 Salem Fields cemetery was founded in 1851 by Manhattan’s Congregation Emanu-El and became the preeminent Jewish burial ground of late 19th-early 20th century New York. Emanu-El, New York’s City’s first Reform congregation, was established in 1845 by assimilated, wealthy German Jews and their prosperity is displayed in their burial grounds. Covering 45 acres in the Cypress Hills area at the Brooklyn-Queens border, the cemetery’s undulating landscape features winding paths lined with the grand mausoleums and monuments of upper-class families such as the Warburgs, Seligmans, Guggenheims, Lewisohns, and Loebs. 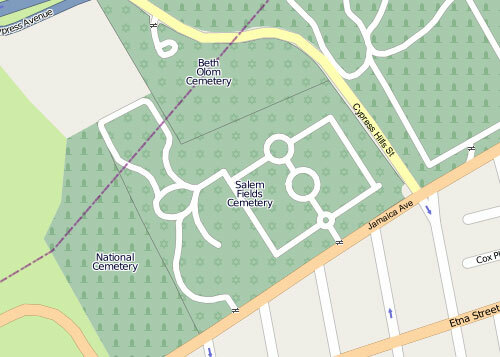 Salem Fields contains about 80,000 interments. 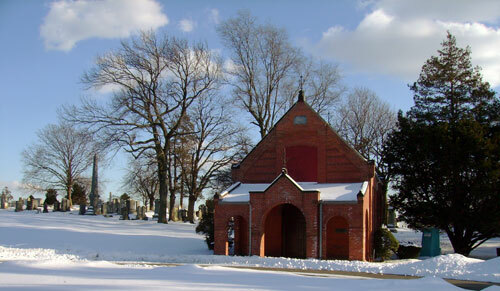 In addition to the family plots and individual graves for Emanu-El’s members, several smaller congregations and benevolent societies also have burial grounds at Salem Fields. The cemetery’s massive stone entryway at the corner of Cypress Hills Street and Jamaica Avenue, which includes offices and a small chapel, was added in 1915. The richness of Salem Fields’ family crypts has tempted graveyard bandits to its grounds on a number of occasions. In 1976, thieves stole nine bronze doors from mausoleums in the cemetery, cut them into sections, and sold them to junk dealers for $250 per foot. At least half a dozen Tiffany windows have also been stolen from Salem Fields, the most notorious case occurring in the 1990s, when Alastair Duncan, an art dealer and one of the world’s leading experts on Tiffany stained glass, was convicted of conspiring in the theft of a window from the Glaser-Bernheim mausoleum. Duncan sold the nine-foot-tall, 500-pound window to a Japanese collector for $220,000. 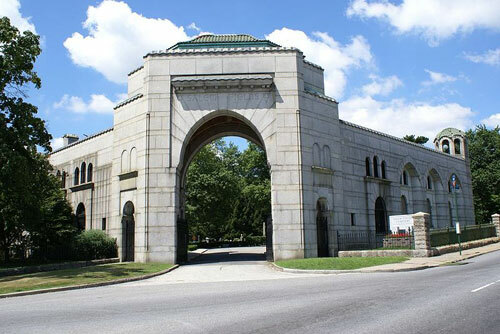 The main entrance to Salem Fields Cemetery, at the corner of Jamaica Ave and Cypress Hills St (Wikipedia). View more photos of Salem Fields Cemetery. Following the closure of its First, Second and Third cemeteries in Manhattan during the first half of the 19th century, in 1851 Congregation Shearith Israel established a seven-acre cemetery in the Cypress Hills area that straddles the Brooklyn-Queens border. 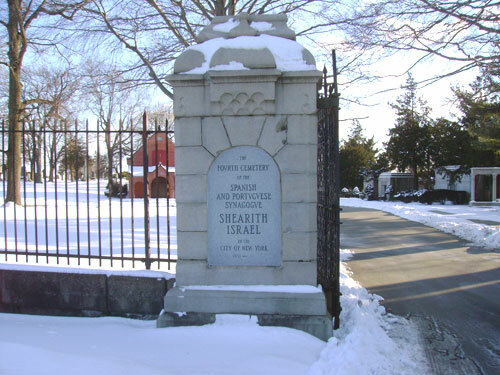 The Fourth Shearith Israel Cemetery is one of three burial grounds that form Beth Olam Cemetery, which is co-owned by Shearith Israel along with two other Manhattan synagogues. 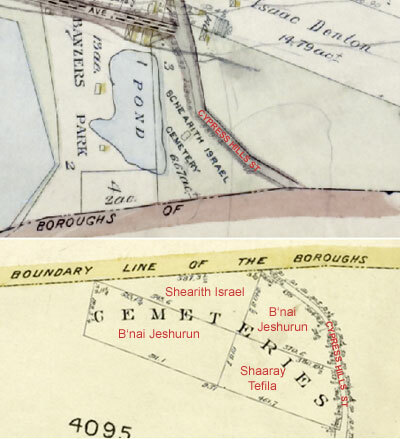 B’nai Jeshurun, NYC’s second-oldest Jewish congregation, founded in 1825 by a faction that seceded from Shearith Israel, has a four-acre burial ground within Beth Olam; Shaaray Tefila, an offspring of B’nai Jeshurun that formed in 1845, has two acres. Beth Olam is located on the west side of Cypress Hills Street, just south of Jackie Robinson Parkway, in the Ridgewood-East New York neighborhoods. About half the property lies in Queens and the other half in Brooklyn. Several thousand members of Shearith Israel, B’nai Jeshurun, and Shaaray Tefila are interred at Beth Olam, including a number of the congregations’ spiritual leaders. 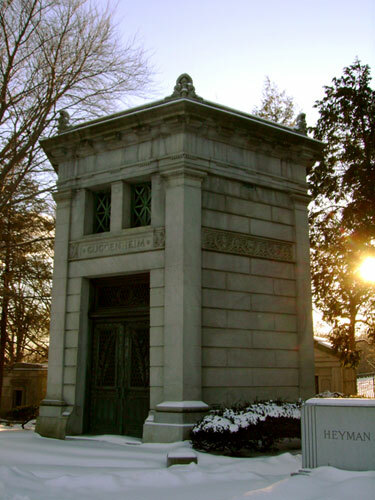 Benjamin Nathan Cardozo, U.S. Supreme Court Justice from 1932-1938, is buried in the Shearith Israel cemetery at Beth Olam, as is his uncle and namesake, Benjamin Nathan, a vice president of the New York Stock Exchange whose 1870 murder remains one of the city’s famous unsolved crimes. Poet Emma Lazarus, whose sonnet “The New Colossus” is inscribed at the base of The Statue of Liberty, is also interred at Beth Olam. The chapel near the entrance to the Shearith Israel section at Beth Olam is the work of Calvert Vaux, the co-designer of Central Park. Commissioned in 1882, the small, red brick chapel is the only religious building that Vaux is known to have built. 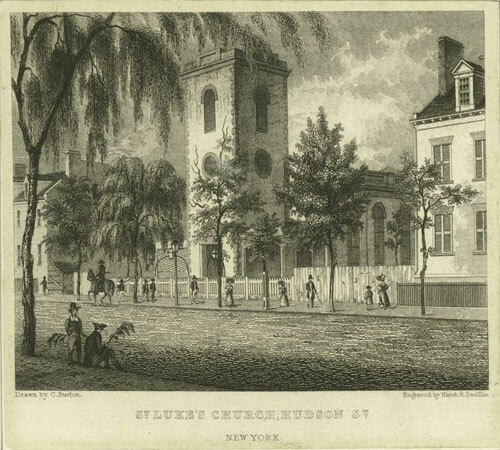 The Church of St. Luke-in-the-Fields, on Hudson Street between Christopher and Barrow, was founded in 1820 by a group of prominent residents of Greenwich Village who were desirous of an Episcopal church to serve their community. Construction of their church, on land donated to the congregation by Trinity Church, began in 1821 and was completed the following year. When the church was constructed, the congregation had about 100 burial vaults built beneath the yard adjacent to the church. Only the flat, inscribed tomb coverings were visible on the surface to indicate the vaults below the ground. Around 700 of St. Luke’s parishioners were buried in the vaults until interments there were discontinued in 1852. In 1891, the congregation of St. Luke’s moved to a new church in Harlem and their Greenwich Village church became a chapel of Trinity Church. As part of the transfer of St. Luke’s to Trinity, the remains were removed from the burial vaults around the church. 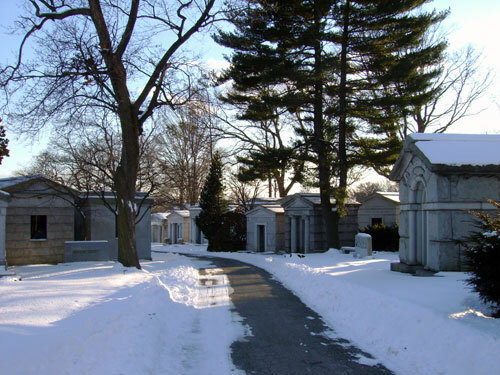 Some descendants transferred their relatives to family lots at other cemeteries, and many were reinterred at a large plot that St. Luke’s purchased at Mount Hope Cemetery in Westchester County. 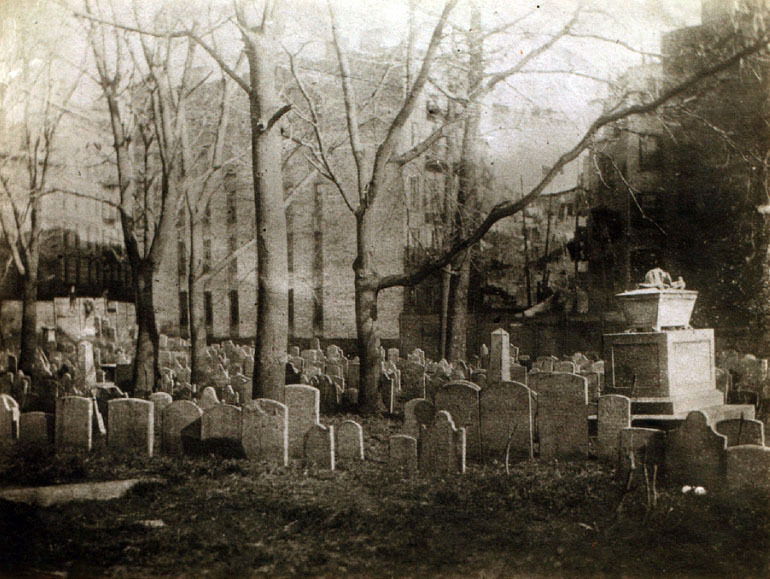 Others were moved to plots at Trinity Cemetery in upper Manhattan and at Woodlawn Cemetery in the Bronx. Clement Clarke Moore, author of “A Visit from St. Nicholas” and one of the founders of St. Luke-in-the-Fields, was originally interred in one of the vaults at St. Luke’s; his body was moved to Trinity Cemetery in 1889. They are underground rooms, arched and walled with brick. A slab bearing the epitaph is placed over the head of the stone stairway which leads to the surface . . . 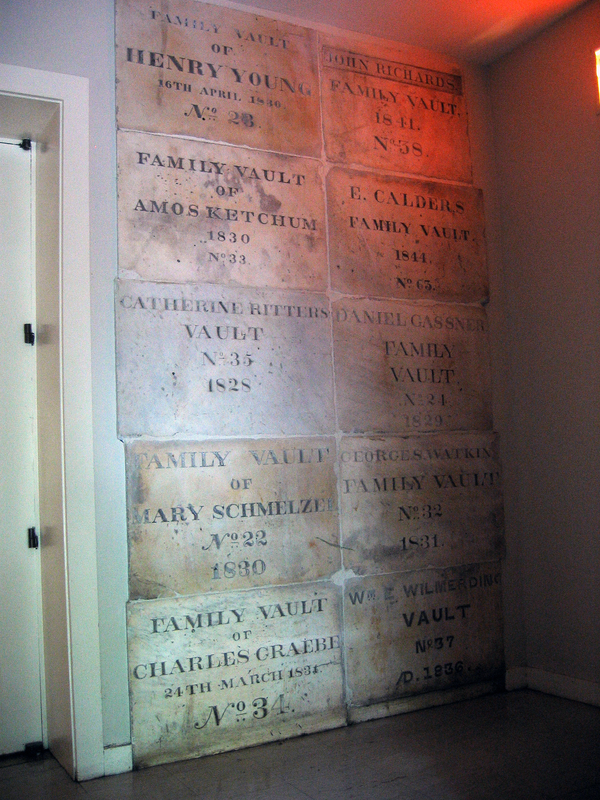 The coffins were piled one on top of the other in all the vaults. The best preserved coffins were those which had been in the ground for the longest period. Most of them were made of black mahogany. The more modern coffins, with but few exceptions, had turned into dust, while some of those which have been in the ground for over sixty years are as solid as when they were built. Dozens of the empty vaults were discovered under the topsoil in 1955, when workmen were in the process of constructing a new school, playground, and gardens on the grounds of St. Luke’s. Most of the marble tomb covers were in place over the steps leading down into the brick vaults, and their inscriptions could still be read. They were covered over again when the property was landscaped. In 1976, St. Luke-in-the-Fields again became an independent parish of the Episcopal Church. The old tombs, where hundreds of early residents of Greenwich Village once reposed, are likely still present under its grounds. Sources: Dripps’ 1852 Map of the City of New-York extending northward to Fiftieth St; The Church of St. Luke in the Fields; Churchyards of Trinity Parish in the City of New York, 1697-1969 (J.V. Butler 1969), 8, 89-90; Meyer Berger’s New York (M. Berger 2004), 158-159; King’s 1893 Handbook of New York City, 512, 519; “St. Luke’s Cemetery Emptied,” New York Herald Dec. 14, 1890; “The Descendants Protest,” New York Times, Oct. 16, 1889; “Destroying Old Memories,” New York Times, Dec. 18, 1888; Ron Peaslee, personal communication, Jan 19 2018. Located directly across from the World Trade Center site, St. Paul’s Chapel and churchyard stand in testimony to the church’s unique history and the special role it played following the events of September 11th, 2001. 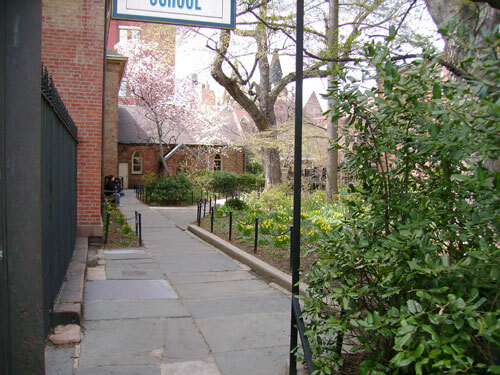 The chapel, which is the oldest public building in continuous use in Manhattan, was built in 1766 by Trinity Church to serve Anglicans living in what was then the northern outskirts of the city. Erected on the west side of Broadway, the chapel was positioned to overlook the Hudson River, with a great yard extending out in front of it. St. Paul’s is known for its pew set aside for George Washington, who worshipped at the chapel during the years that New York City served as the nation’s capitol. 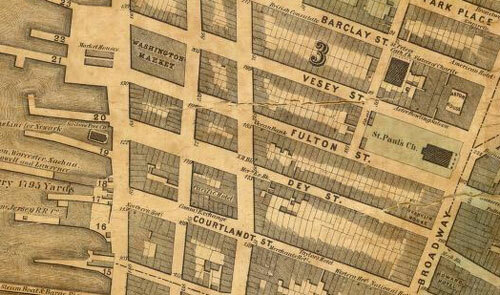 St. Paul’s churchyard is bounded by Broadway on the east, Church Street on the west, Vesey Street on the north, and Fulton Street on the south. It contains about 800 gravestones, and 30 vaults lie under the churchyard and chapel. Revolutionary War hero Major General Richard Montgomery is among the prominent individuals buried there. 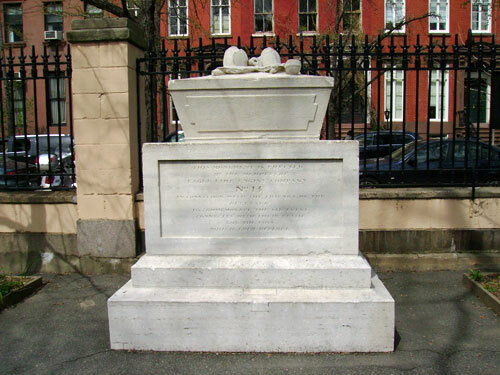 In 1818, over four decades after his 1775 death at the Battle of Quebec, Montgomery’s body was interred beneath the Chapel’s east porch, where a monument to him had been erected by Congressional order in 1776. 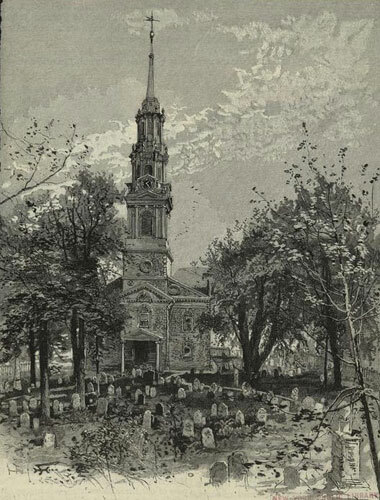 Burials in the churchyard discontinued after interments in lower Manhattan were prohibited during the first half of the 19th century, although occasional interments were made in the family vaults into the early 1900s. 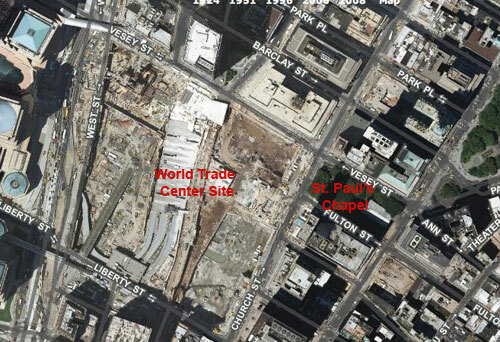 Building 5 of the World Trade Center stood just across Church Street from St. Paul’s, and the Twin Towers were one block away. 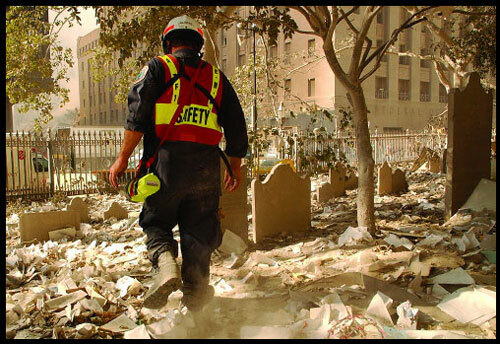 When the buildings collapsed after the September 11th attacks, St. Paul’s churchyard was covered with dust and debris and a few tombstones were broken, but overall remained relatively unscathed. It is thought that the trees in the churchyard helped shield the chapel, which suffered no physical damage. For eight months after the attack, the chapel served as a relief center for recovery workers working at the World Trade Center site and became an impromptu shrine for mourners. Following a $300,000 restoration, St. Paul’s Chapel reopened to the public in August of 2002 and the churchyard reopened a year later. The restoration project included conservation of the headstones, which were vacuumed and washed to remove corrosive particulates that had been embedded in the surfaces from the dust storm that accompanied the collapse. Two inches of ash-filled topsoil were also removed and replaced with new sod. Today, the chapel offers exhibits and memorials that tell its part in the September 11 story, and the historic churchyard provides a contemplative place to view redevelopment of the World Trade Center site. Sources: Dripps’ 1852 Map of the City of New-York extending northward to Fiftieth St; St. Paul’s Chapel; St. Paul’s Churchyard; Churchyards of Trinity Parish in the City of New York, 1697-1969 (J.V. Butler 1969), 54-78; Walks in Our Churchyards (J.F. Mines 1896), 130-151; “Polished Marble and Sacramental Scuffs,” New York Times, August 25, 2002; “At Ground Zero Oasis, a Path is Restored,” New York Times, Nov. 7, 2003; NYCityMap. 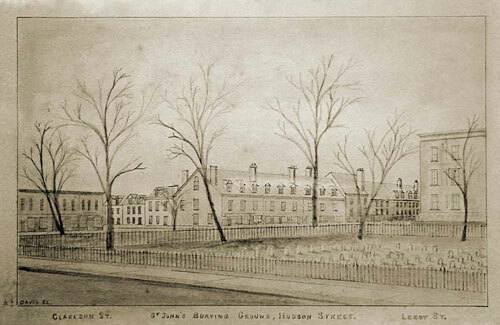 In 1808, the Evangelical Lutheran Church of St. Matthew purchased six lots of land on the east side of St. John’s Cemetery in Greenwich Village to serve as a Lutheran burial ground. 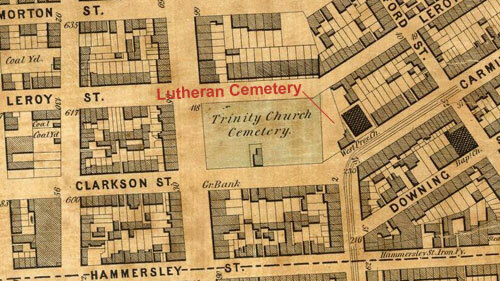 Adjacent to but separate from St. John’s, the Lutheran graveyard was at the junction of Carmine and Clarkson Streets, opposite the northern end of Varick Street. The property was roughly triangular, having a frontage of about 100 feet on Carmine Street and 44 feet on Leroy Street. By nightfall more than a dozen graves were opened. Large crowds of people gathered around the inclosure and looked curiously through the picket fence toward the groups of workmen inside. Old gentlemen dressed in black stood by the graves superintending the laborers who were digging up the bones of those who were with them half a century ago. Gray-haired men came with coffin-like boxes to receive the remains of their wives and children. One gentleman, after working for an hour, found that the bones he had did not belong to his family. In one place there stood a casket half filled with ribs, blackened silver plates, and tresses of hair, skulls, and shin bones were lying among the decayed coffins, awaiting a second burial. 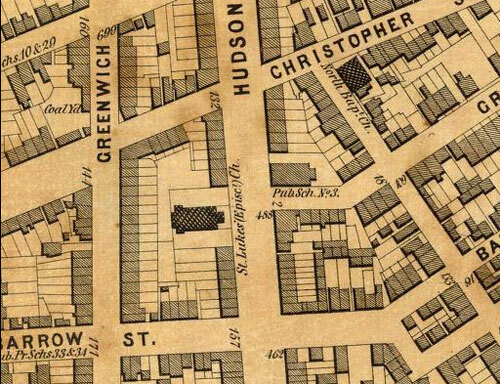 Remains of an estimated 1,500 individuals were removed from the Carmine Street cemetery and reinterred at the new Lutheran Cemetery (now known as All Faiths Cemetery) that was established in Queens in 1850. 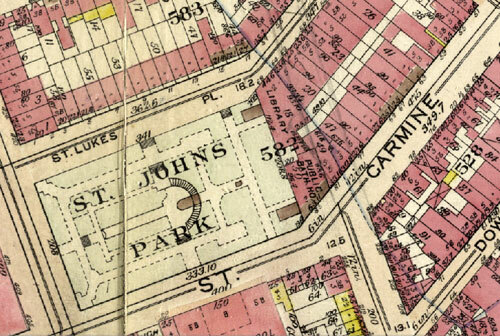 The Hudson Park Library and Carmine Street Public Bathhouse (today’s Tony Dapolito Recreation Center) were built on the Carmine Street cemetery site in the early 1900s. Sources: Dripps’ 1852 Map of the City of New-York extending northward to Fiftieth St; Bromley’s 1911 Atlas of the City of New York Pl. 9; “Removal of Remains from the Carmine-street Lutheran Cemetery,” New York Times Sept 29, 1869; “The Carmine-St. Cemetery Exhumations,” New York Tribune, Oct. 2, 1869 p8; “Exhumation of Human Remains at Carmine-street Cemetery,” New York Times, Oct. 30, 1869. There may be eight million stories in the Naked City, but there are countless stories of loss represented in the city’s graveyards. In Mount Lebanon Cemetery in Queens, the monument to Celia Sanders and her five children embodies one example of intense personal tragedy. Striking in its size and simplicity, the memorial is in the form of six blocks in descending height that represent the mother and her children, aged four to fifteen, who perished together in a tenement building fire in Manhattan’s Lower East Side in 1932. Abraham Sanders, the father, and his sole surviving daughter were joined by 3,000 mourners at the family’s funeral. 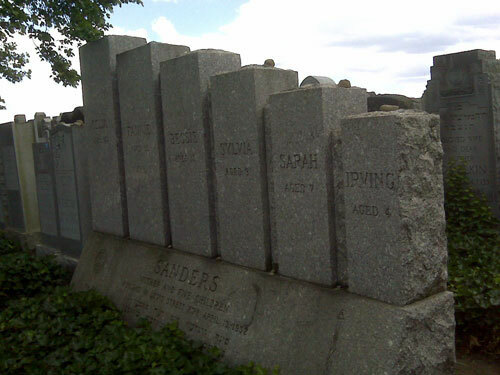 The Sanders family is among over 88,000 interments at Mount Lebanon, a Jewish cemetery founded in 1915 on 85 acres of dormant land purchased from Cypress Hills Cemetery. 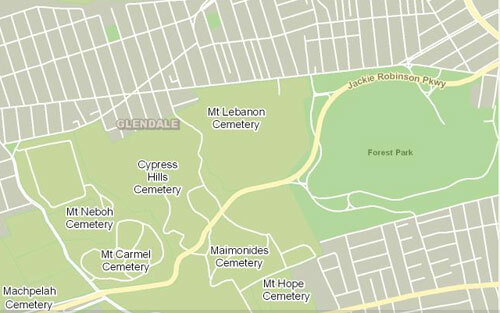 Located south of Myrtle Avenue in Glendale, it is bordered by Cypress Hills and Jackie Robinson Parkway, and is one of a number of cemeteries along the Queens-Brooklyn border. 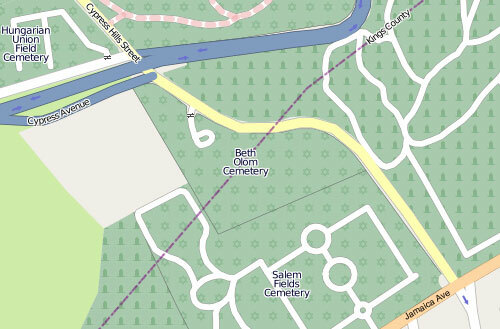 Over 240 societies and synagogues have areas in the cemetery, and thousands more plots are owned by individual families. 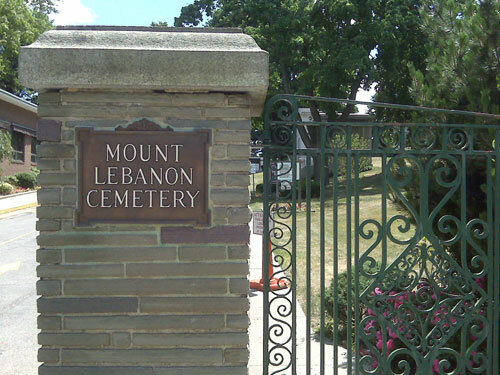 View more photos of Mount Lebanon Cemetery. 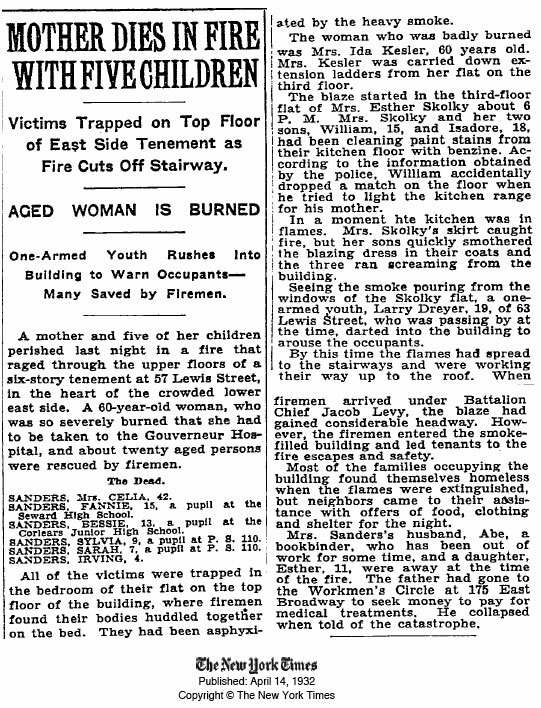 Sources: “Mother Dies in Fire with Five Children,” New York Times, April 14, 1932; “Six of Family Buried,” New York Times, April 16, 1932; “Cemeteries of Greater Ridgewood and Vicinity (R. Eisen, Greater Ridgewood Historical Society Lecture, Aug. 1988); A Living Lens: Photographs of Jewish Life from the Pages of the Forward (Newhouse 2007), 129; Mount Lebanon Cemetery; NYCityMap.